Hellebore for sale is best purchased and planted in the early spring. 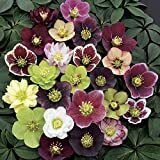 It is commonly called Christmas or Lenten rose. Hellebore for sale is usually a bare root plant divided from a clump from the mother plant. The blooming time of hellebore is during the late winter or early spring, sometimes even while the ground is still covered with snow. Although this may vary on the variety of hellebore you purchased. This plant requires minimal level of care once established. 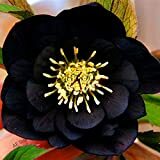 However, remember to take caution when planting and keep children and pets away as all parts of the hellebore plant are poisonous. Location – Choose an area in your garden with dappled shade. Provide some shelter from strong, cold winds. You may plant your hellebore under a deciduous tree for instant filtered sunlight. Make sure the place is wide enough to facilitate growth as hellebores do not do well in constant transplanting. The area you choose will be its final home. Soil – Hellebore prefer rich, neutral to slightly limy soils with pH of about 7.0. Make sure your soil is well-draining and does not get waterlogged. You can organic matter and grit to the soil to improve drainage. Adding generous amounts of organic matter will greatly improve both the moisture retaining capacity and the nutrient levels of the soil. Planting – Dig a hole that is twice the width and depth of the root ball. Your hellebore should be set so that the soil level is at 1 inch above the point at which the roots are attached to the crown. Space your hellebores at least 18 – 24 inches apart to allow room for growth and spreading. You may need to place some stake for tall varieties to avoid them falling over. Water – Water after planting and during dry spells, although they can handle dry periods well. Keep the soil moist to allow better growth. Fertilizer – If your hellebore’s growth is unsatisfactory, you may apply a general purpose fertilizer in the spring. While container grown plants can also be fed with balanced liquid fertilizer or high potassium ones like tomato feed. This will encourage blooming. Add a good layer of farmyard manure around the early winter time before the ground freezes. Avoid feeding the plant with too much nitrogen because this will result in lush foliage but shortage in blooms. Mulch – You may add some mulch around the base of your hellebore annually using leaf mould, chipped bark, or other organic matter in the fall. This will help retain the moisture of the soil which is necessary for your growing hellebore plant. Pruning – Remove old leaves on stem less types in the late winter or early spring as the flower emerges. 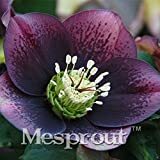 This will expose flowers hidden by the large hellebore leaves and will decrease the chances of harboring a fungal disease called hellebore leaf spot. Cut off spent flowered stems to ground level.